Asiana Crash: Plane Was 34 Knots Below Target Speed, NTSB Says : The Two-Way Investigators are interviewing the four pilots of Asiana Airlines Flight 214 today. At a briefing, the NTSB says that three seconds before Saturday's crash-landing, the aircraft's speed was 103 knots — the lowest measured by its data recorders, and far below the target speed of 137 knots. 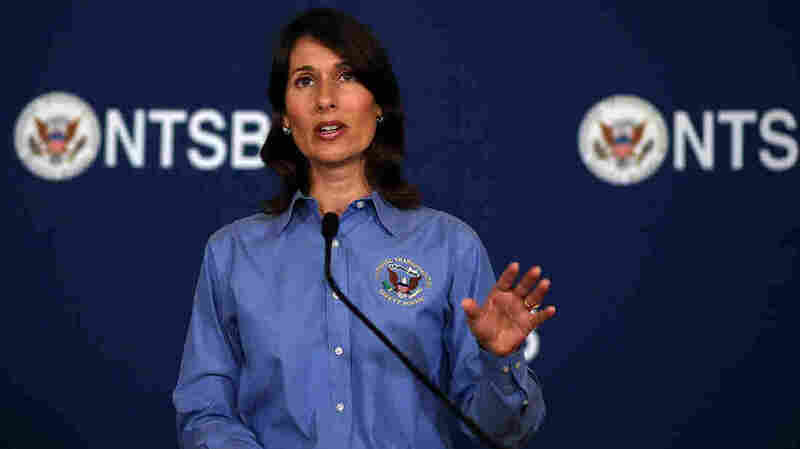 National Transportation Safety Board head Deborah Hersman speaks at a news conference in San Francisco on Monday. Three seconds before it struck the ground Saturday, the speed of Asiana Airlines Flight 214, a Boeing 777, was 103 knots — the lowest measured by its data recorders, and far below the target speed of 137 knots, says National Transportation Board Chairman Deborah Hersman. The crash-landing at San Francisco International Airport left two passengers dead and more than 180 people injured, as Mark reported for The Two-Way this morning. NTSB investigators are interviewing the plane's four pilots today, Hersman said at a midday news briefing Monday. She confirmed that the pilot who was at the controls as the plane made its approach "was working on getting his rating on the 777" and was flying with a training captain. Another set of pilots was also on the flight, as is common on long international trips, she said. More information about the pilots would likely be available at Tuesday's planned briefing, Hersman says. As for reports that one of the Chinese teenagers who died in the accident Saturday might have been hit by an emergency response vehicle on the tarmac, Hersman says, "We are still looking at this issue. ... The coroner has not yet determined the cause of death." An initial review of video from the scene "wasn't conclusive," she says. The crew had flown in on a 17-mile straight approach, heading to San Francisco from the air over Sacramento. Radar data shows "no abnormally steep descent curve" in what has been reviewed. Evaluations show "that both of the engines were producing power" when the craft hit the ground. The No. 2 engine showed "evidence of high rotation" at the point of impact. Lower portion of the tail cone is in the rocks at the sea wall before the runway. Debris from the sea wall was found "several hundred feet" up the runway. The impact occurred about 82 seconds after autopilot was disabled. At 200 feet, the plane's airspeed was approximately 118 knots. Three seconds before impact, the craft's speed was 103 knots — the lowest measured, and far below the target speed of 137 knots. When it struck, it had accelerated to 106 knots. The call to abort the landing and go around again, made seconds before the crash, is heard in the cockpit, but it wasn't made to the control tower. Investigators are looking into reports that at least one emergency ramp may have deployed inside the aircraft. Fuel samples have been taken for testing. Flight and data recorders will be transcribed and reviewed for both verbal statements, as well as sounds made by the aircraft. There is a mix of English and Korean spoken on the voice recorders. 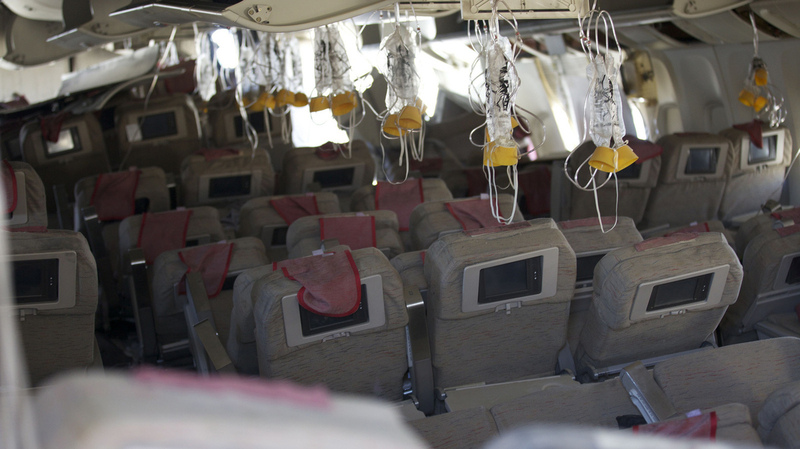 "There are 1,400 different parameters that are measured" by the flight data recorder. The plane involved had not been involved in previous problems or incidents. One group of investigators will focus on how the plane performed only during the flight and approach, using videos of the crash-landing as well as evidence from the runway area. Other analysts will be looking at how the plane came apart when it struck the ground, reviewing what pieces broke off, and which elements remained attached. A photo published by the NTSB shows the interior of Asiana Airlines flight 214, which crash-landed at San Francisco's airport Saturday. The investigation into the crash, which killed two people, is continuing.